There’s something for everyone here; romantic couples, families, and in my case - a big group of friends. Food is of excellent quality. We stayed at the Novotel near Suva, and it paled in comparison. Facilities are good. It is on a self-contained island with a 6 bars & 4 restaurants, bike hire & tours, kayaks, golf, snorkeling, 3 pools, and other activities. There are good restaurants nearby (Geckos & Tomlu’s). And is a short taxi ride to Sigatoka. We also went zip-lining nearby, and to the mud-baths near Nadi. Is well set-out. Rooms are good. Service is good. I have been to the Shangri La on a few occasions and it never disappoints. A wonderful resort staffed with amazing people who go out of their way to make you feel welcome. This is the ultimate resort for all, plenty to do, great food and even better service. It was lovely to see so many happy smiling Fijian people working at the resort . Don't really have much to complain about the Shangri-La. This was our 7th trip to Fiji and our first time stay at this resort. Stayed in mid Jan and travelled with 4 other families. Our room was spacious (1bdrm suite near the Reef Safari) and newly renovated. Had a few issues, but nothing which really bothered our family of 5 or house keeping couldn't help resolve. The breakfast buffet was amazing compared to many other resorts we have been too in Fiji. There were so many options and there were a few different items each day. I really don't know what other people are complaining about. You need to be there before 9am else during peak times, you would have to queue to get a table. The food standards for lunch and dinner were great. The Bar and Grill is well recommended for their al la carte menu. Food is served fairly quickly and prices are reasonable. It is worthwhile to get meal vouchers when you book. For a family of 5 over 10 days, we spent about Fj$1700. Our main meals were breakfast and dinner. We had light snacks and a few drinks while at the pool or on the beach during the day. Have to say the drinks alcohol and non alcoholic were on the pricey side. The resort is unexpectedly large, so be prepared to walk from one place to another. But it is a wonderful way to explore the resort. There is a Westpac ATM on site (Fj$15 transaction fee on top if your usual banking fees). A few souvenior shops on site and also a mini-mart to get your snacks and staples/emergency items. Have to say, this is the first resort we have been to Fiji which didn't supply fins and snorkles for patrons to use for free all day. There is a charge of Fj$10/pp per day after the first hour. The snorkel safari is well recommended and a trip to a village/school and Sigatoka. Have always loved going to Fiji and this has been the best holiday so far. Our holiday was great. The resort was lovely and the staff were amazing! My only dislike was that the pools closed at 6pm each evening so there wasn't a lot aside from eating that could be done - our kids enjoyed kids club but would have preferred to be swimming under lights at night! Shangri La staff are very helpful. 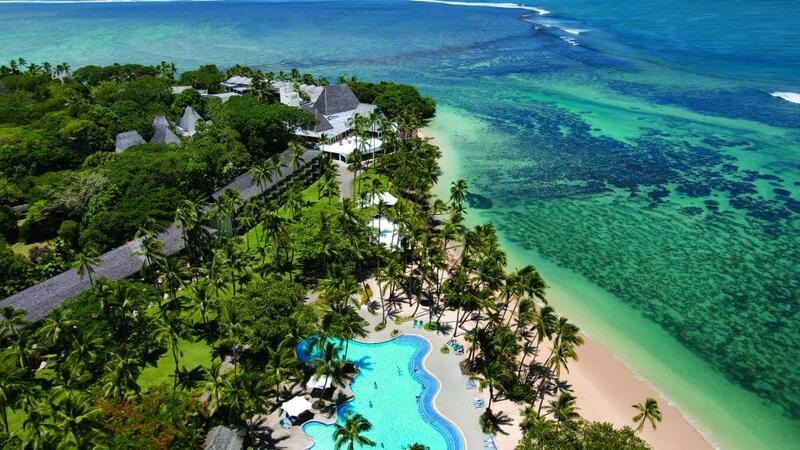 Love the Shangri La Fiji, great location and perfect for families of all ages. Heaps of fun for everyone. Fantastic accommodation, rooms are good and comfortable, loads to do for everyone - golf, massage, swimming in the pool, beach, snorkelling in the lagoon, aqua splash, paddle boards, tennis and loads more to do. Add to this the most amazing sunsets and fantastic food and its an amazing place for a holiday. We are a family of four. Our two children aged 5 & 8 really enjoyed the holiday and loved the kids club. Frog races and crab races for the kids. Was nice to be able to relax while they were having fun. The food was lovely. Staff amazing. Would recommend this resort to anybody. The main pool was beautiful and clean, had shallow areas for young children and a deep end for scuba diving practice. The toddlers pool was lovely. We had a look at the adults only wing of the resort and it is beautiful with a stunning infinity pool. This place was better than I imagined it to be and we all had such a relaxing time. This restaurant was amazing- so many dishes to choose from- great price too, beautiful views of the coral coast from this just renovated resort! A very relaxing holiday. If that’s what you’re hoping for, then this location is perfect. Service was fantastic. All staff were warm, kind & generous with their time, especially our children. The water activities were great. Pools were very good also. Accommodation was well appointed and clean. My only comment is that the family sleeping arrangements were fine for our young children (9,6 &4) however any older/bigger than this you may wish to consider an alternative room or interconnecting options that have proper beds. The divans were fine for our two younger children but my 9yo would have struggled if had to sleep on them. Otherwise overall a fantastic family holiday & we would visit again! Friendly, happy people. Every day was like a postcard. Thoroughly enjoyed our stay at Shangri la. The staff are lovely and always willing to help. Our rooms was situated away from the main activities and dining which made it peaceful. Overall we were happy with Shangri la and would return to this hotel. Just got home from a 6 night staying lagoon deluxe king room. Travelling with hubby and 3 and 5 yr old daughters.Room was nice, would recommend ground floor if available.we were on 2nd floor.Trundel bed was very narrow but our 3yr old prefers our bed anyway. Breakfast was fantastic!!! Great variety,service and location. We had $350 room credit and that was almost enough for us as we didn’t buy alcohol and ate either lunch or dinner at the Beach Bar and Grill,great food every time.We took snacks, noodles, long life milk from home.We also got our driver to stop on the way to grab some beer and water. You can drink the tap water there. Our package included a free romantic dinner at the Italian Restaurant,$200 to spend, absolutely delicious!! Although there are renovations going on down the other end it didn’t effect us around the lagoon pool.we walked to the golf shop,chapel and across to Gecko’s resort over the entrance bridge.Craig from security was lovely at the main entrance and Rachael at the chapel cracked us open a coconut which we all loved eating.Thanks again! Kids club was good and our babysitter Terisia was very nice. Another amazing stay at the Shangri-La! This resort is one of my favourites in Fiji. Warm welcome, friendly helpful staff, great service and staff that take pride in ensuring everyone has a great stay! Great facilities, additional tours and lots to do or just relax! Couldn’t recommend it highly enough. This resort is fantastic for families with young children. Plenty of activities to do while the parents relax by the pool, get a massage or snorkel. Expect to pay resort prices for food and beverages though. Good also for honeymooners and couples. Thankyou for the wondering time. Looking forward to Seeing the adults only area when it reopens. We travelled to Fiji on a family trip to celebrate a milestone birthday. Group stayed at the Shangri La which was a great choice. Lovely grounds, wonderful staff and something for all ages to do. We will be back!! Relax and rejuvenate in just a few days. Great resort, rooms were clean, bed comfortable, staff were absolutely superb. We had a good time the Nanny was very nice and happy Lita. The new water park was so much fun! Beautiful place to stay. Heaps to do and wonderful staff. Our family enjoyed our stay at Shangri-La. Our boys loved the waterpark and the games room and used these most days. We enjoyed the breakfast each morning and found the options for dinner good for our 8 night stay. Our boys have food allergies and the Shangri-La staff were very helpful with this and also careful and thorough as well which was impressive. We would love to visit again. This is our 3rd stay and we had a great time with the family. We absolutely loved all aspects of our stay at the Shangri La and could not fault a thing. Staff were super friendly, beach and pool were amazing, water park was unreal, food was sensational and rooms lovely. Easy holiday for a family and young couple. The value was worth the trip and the service was great! Really happy. Great service. Good range of activities. Great for families. Just an easy, relaxing holiday. It was the perfect place for us to visit with two young children, loved the place. This was the perfect place for us to unwind and relax. The children were able to swim and take part in a number of activities. Breakfast was a treat to look forward to each morning and the Beach Bar and Grill was our stop for lunch and dinner. The food was fantastic and the friendliness of the staff made each dining experience a pleasure. Beautiful location, great place for a relaxing holiday with the family. We picked Shangri La Fiji because it looked so inviting. We will return because of the staff. They are some of the warmest, happy and generous people we've ever met. Had a great time. Great place to stay. I highly recommend this place for families. We spent 6days and it was enough to stay in one place. We had an awesome time here, so much to do. Loved that you can snorkel straight off the beach. The inflatable water park is a must - so much fun!! Wifi was a bonus. Staff very helpful. We had a fun, relaxed and amazing holiday!! Highly recommend!! great snorkelling off the beach. Food a little expensive. Most staff were very friendly. Shangri-La is a great place to stay for a family holiday, convenient location, friendly staff, currently updating a number of eating venues. Highly recommended. We loved our stay at Shangri La Fijian Resort. The food was great, facilities very good & the staff all very friendly & accommodating. Nothing was too much trouble & their smiles greeted us everywhere. Bulla. We will certainly be back. We appreciated the adult only dining & pool. A great idea for those of us that are travelling without children & want a relaxing time. Tropical location with facilities to suit all ages and needs. Several pools, restaurants, gym, spa, tennis, golf etc. Have visited many times over the years and found the food to be greatly improved. Amazing resort, great facilities, customer service, loved our food especially at beach Bar & Grill! The Fiji people here were just beautiful and we can't wait to come back! Also beautiful Sarah in the beads and braclets section up from the foyer! It is hard to fault the Shangri-La except to say our visit was too short! What a resort! There is so much to do and absolutely nothing you have to do, it's so easy to get involved in activities, water sports for all ages. Or do nothing but enjoy the perfect surrounds. Everything you need is right there, the food is excellent and the kids club was so much fun our child couldn't wait to go everyday. We will return and stay longer next time! The location, food, and staff are 5 stars and 7days was def not enough for us we didnt want to leave. Beautiful surroundings & authentic feel about the property. Great resort and lots for the kids to do. Beautiful place with friendly staff. Breakfast was awesome. Not much varities for dinner. Good overall experience. Shangri la fiji was amazing, rooms were great, service was awesome. Love the relaxed nature of everyone. If you are in a rush and can't relax fiji is not for you. Take a good book and plenty of sunscreen and just enjoy your life away from the rat race of big city living. A fabulous family holiday destination. We will be back! Thank you to Resort Manager, Chris, and the entire Shangri-la Team. Chris is an exceptional manager and went out of his way to ensure our stay was very special.He arranged for us to be in a room next to our friends, so our little boys could play together while the parents got a chance to chill out. And followed up on surfing advice to the boys. Our room was beautifully cleaned every day and our little boy loved to find the towel animal on his bed each afternoon. The floating water park was a fabulous surprise! WOW!!! We can certainly recommend this resort for a fun, relaxed and enjoyable family vacation. Staff very friendly, and obliging. So many activities to keep both kids and adults occupied. No shortage of delicious food and amazing views. A truly wonderful stay. Great place for kids, lots of activities. Terrific all around resort. Renovations have improved it out of sight. Our family thoroughly enjoyed our stay here. It was not overcrowded. Whilst it’s not a 5 Star Resort, if you can appreciate it for good food, friendliness, fun and activities for kids you’ll be happy. From the moment we arrived at the resort we felt at home. Everyone was so welcoming. We were meant to stay in an Ocean Grand Deluxe room but it was still being refurbished so we were upgraded to 2 interconnecting rooms with reef views. We were in a ground floor level and was so good for our 3 kids as they spent a lot of afternoons on the grass kicking the ball. The room was in a very quiet location and located close to the Takalai restaurant which proved to be our favourite at the resort.We found the food to be the best here and the staff looked after us well. All the staff were so lovely with the kids from the boys at the gates, the lifeguards, the lady that did our rooms for the day and left adorable little creations with the kids toys, kids club ladies, our lovely Nanny Andi... the list goes on. We absolutely loved our stay here. The staff were welcoming and nothing was too much trouble. The resort genuinely welcomes and caters for children, and we felt completely safe to let the kids engage in all the activities available knowing the staff were taking good care of us. Food on the resort was generally quite good, dietary requirements were well catered for. Beautiful setting, comfortable rooms, amazing spa and lots of fun stuff to do. Amazing, wonderful staff. We will be back. Loved our stay at the Shangri-La we’ll defiantly go back. The breakfast menu is always the same which got a little boring after the second day and I find the staff at the restaurant a little slow. They are all so friendly though, it’s hard to be negative. Bula! I have just returned from 8 nights at this resort with my wife and 2.5 year old twin boys. The best part was the nanny service. We had the same nanny every day, she was excellent with our boys, punctual, nothing too much of a problem, and best of all cheap as chips (A$4.50 an hour!). BULA, Great Family holiday, all the staff are so friendly, rooms were clean food was ok, romantic dinner was great, get ground floor lagoon deluxe room if you got kids in front of pool. This was our second stay at this resort and we will be back. They are working hard on completing an upgrade, especially to their main restaurant, but the didn’t effect us too much. It is a shame the Italian place is only for adults and kids can’t eat there. Outstanding Kids Club with with lovely staff and an amazing water park with friendly and helpful life guards. Hopefully when all of the renovations are complete, this place will be even better. Excellent family resort. Staff so friendly. Room was very clean/great location. Food was delicious. Great atmosphere. Plenty of activities for kids. From the staff, porter drivers, housekeepers, waitresses, security to even the chefs practically everyone who works there they all greet you with a warm welcome everyone says hi when you walk past, it truly was the best holiday i've had. The duty managers esp the Asian lady was kind & lenient to my requests, the front ladies who pleaded my case when i missed my transfer bus to a tour but i was in the lobby just wasn't called out helped me get on another bus to get to my tour! The porter drivers who were kind enough to drop me & pick me up even just to the front entrance. Security who gave my date a visitors pass so he can roam freely with me at resort. I visited with just my 2 kids & i but i never felt alone!! I felt so safe. A driver was organised for me thank you Moses for being a 5 star chauffer. Chandra my housekeeper left a different animal on my bed every morning made out of a towel and an "i love you" msg using necklaces my kids loved it!! The pool bar had waiters come to your sun bed asking if you require anything. I had a fave waitress at the Buffet who always looked after my kids & i reminding me of Indian night or Fijian night. You literally don't lift a finger here. Overall i will not stay anywhere else & Shangri-La i will be back!! Enjoyed our stay.Lovely sunny days.Good weather.Friendly hard working staff. Set in a beautiful location with incredibly friendly staff. I would think this place and the trip is the best fit for a family with children, allow for at least a week long,,Take a trip to nearby local town and market, you would find an amazing experience there. Thank you Shangri-la for giving us some peace and relaxation for our young family. We had a great time and loved the friendly staff. We absolutely loved our stay at Shangri La Resort. The service was amazing, the people are amazing, they were wonderful with my kids. They had so many activities to keep the kids entertained. The food was absolutely delicious. I don't have any negative things to say about this resort. Such beautiful people and a beautiful culture. "BULA VINAKA"
The staff are amazing very good with kids thanks to all the great staff at the shangri la really recommend it for family’s especially with kids they were awesoum thanks to Jay, Eddie, Marly, Rosa, ace, wise and the rest of the staff there you were all more than great thanks for the royalty treatment these guys have become like family, love you all and hope to see you all soon. We were very impressed with the Shangri la. Beautiful place, people and surroundings. Went with a 3yo who loved the pool as did we, plus the happy hours! Rooms were lovely and a good size and renovated and we had adjoining rooms which made it easy for 2 families. Bathrooms were very spacious and had everything you need. Meals were good and plenty of options. Plenty to do if you want to, or just sit back and enjoy the view. Adult only pools also available. Staff were lovely and very helpful. We'll be back! It was an amazing holiday. The place and the people was very welcoming. It's a paradise for kids and for parents. Well organised activities for everyone. The staff was the best I have ever come across. The food can do better . For the price it's not amazing. Needs a good coffee machine. We love going to the Shangri La, nothing is a problem for the staff there, so friendly and helpful. We had a perfectly balanced holiday of relaxation and activities. Resort facilities were perfect for our needs. We went at a quiet time which made things more comfortable for us. Our kids (9 and & 7) attended some kids club sessions and loved it. While they were there, dad went scuba diving and mum went to the spa (both at extra cost) or enjoyed time in the pool. Resort staff were awesome. Friendly and helpful and quickly learned our kids names. Food was good although pricey. We left the resort for 4 dinners. 2 nights each at Tomlu's and Stallions restaurants - both a 5min and $10(rtn) cab trip away. Their meals were fantastic and cost us about 150 FJD for meals and drinks for the 4 of us. Kids are already talking about when we can return! A very enjoyable family holiday! Fantastic pool / pools for the young ones ! Rooms were very clean & Tidy . Staff always friendly ! Food was a bit average..... they definitely cook seafood the best ! The resort and location are beautiful, the staff are very friendly and helpful. Our family room wasn’t quite big enough for 5 people but we managed, our room had a horrible smell for the first couple of days coming from the air conditioner, could only smell it when entering the room. Overall experience was great, we will return for another visit. Beautiful facilities, great service, enjoyable stay. Will recommend highly. We all had a wonderful time. The staff made the time just perfect with there infectious laughs and very helpful manner. There was so much to do that it covered all ages. The pools are just great and with the beach and sea so close you can take your choice. The food is great and the new renervations are just supburb. All you wish on leaving is that it want be too long till you return. A beautiful resort with something for all ages. A bit dated it parts, but certainly nothing that would stop me from staying there again. Staff always friendly, warm and helpful in all areas and departments. Beautiful Location and great people! Loved my holiday. Great Service! There are no words to describe how fantastic this resort is. Havent been to Fiji for about 4 years and Shangri La Fijian Resort didn't disappoint. We had a great time, the staff were lovely, the food was great, is a little bit more expensive then last time we went but still the perfect break before returning to work for another year. The Shangri-La Fiji occupies the whole of a small island joined to the mainland by a 100m causeway. The resort lobby was beautiful and all of the staff extremely friendly and helpful (including the 'gate keeper'. Whilst the food and drink prices are comparable to Australian restaurants, it can add up quickly. We suggest going into Sigatoka and stocking up on some much cheaper food and drinks including water. The resort can arrange transport to Sigatoka. The food we did purchase at the resort was good. The breakfast buffet was excellent. The housekeeping at the Shangri-La is patchy but the housekeepers are lovely. We did get cute little messages and towel animals left on our beds. All other facilities are good including the spa, 3 pools, water park, playground, tennis & basketball courts, golf course. The Fijian people we met were happy and friendly. You will quickly become familiar with the terms 'bula' (hello) and 'vinaka' (thank you). I loved Fiji and will return. Very nice resort in lovely location. The staff were very nice and friendly but things were a bit overpriced. We had a great family holiday at the Shangri-La Fiji resort, staying in adjoining ocean view rooms. The facilities and friendly service were outstanding and the resort is in a most beautiful setting. The only complaint was with some (not all) of the dining which we felt was overpriced and occasionally substandard. Absolutly perfect for families. We had such a fantastic time. Everyone was soo nice. A great family holiday - pool and beach all day almost every day!!! Super friendly and helpful staff. Everyone was so accommodating with the kids. The nanny service was amazing! Overall very relaxing for parents and with lots of entertainment options for the kids. Loved the location, lagoon, pool and lawn activities were all close to our room. So many activities for kids and the downtime for parents. Can't beat the cocktails by the pool... which were delivered to you, was great! Snorkeling was amazing, so much to see, and the staff were incredibly friendly! I would highly recommend this resort for families. The staff were so friendly with the children and there were activities planned for each day. The resort is very family oriented and rooms were clean and tidy. We had a fantastic relaxing holiday. This hotel is perfect for a fun family holiday. Great location not too far from airport. Plenty activities for the whole family or simply to take in the scenery and relax. Breakfast is great and other food is nothing to write home about, but generally good. Beautiful location, lots of things to do. Food and beverage is expensive and the resort is a bit dated. Staff are friendly, service was good and overall a great family holiday! Wonderful place to take the family the people are really friendly, the pool is great, the rooms were a little tired but they're getting renovated at the moment, the restaurants were nice and there was a few choices available. We loved our stay at the Shangri-La ,everybody was friendly and helpful , there was activities available all the time , the food and service was awesome . I highly recommend the cabana romantic diner for 2 , the food was delicious and the service was excellent , thank you Fiji . A really great place for families. Made to feel welcome at every part of the resort. Great food, and lots of variety. The plans for renovation and development will make this even better. We will go back. The current renovations did not impact on us in any way. Great stay at a fantastic location,service was great. We went as a couple and found the adult only pool and breakfast excellent. The Asian restaurant was excellent. Wine very expensive, room service handy but could be very slow. Beach area was good with white sand and decent area to swim and snorkel. All in all good value with the package we received. Great place to stay for families with small kids. This was our second trip to the Shangri La, Fiji. We spent long lazy days around the pool and swimming with the kids. We mainly ate at the beach bar and grill. The food is good....... not great. I felt the food in terms of quality and price was comparable with aussie pub food prices. We found it was cheaper to dine at the beach bar and grill than it was to go to the buffet, even though the kids eat free at the buffet. Don't worry about the renovations that are on-going. We were in the block beside the area being renovated, and barely noticed that they were going on. This is our 4th stay at this resort. We are treated like family when we return. A great venue to relax and soak up the Fijian sunshine. Overall a great resort ( particularly for families) this is our 2nd trip to this resort but on this occasion we left our 2 teenagers at home as the kids stay and eat for free does not extend for 16 & 17 year olds. I feel that once at the resort all the "extras" are extremely overpriced. Location is fantastic. Great for a family holiday. Relaxing with plenty to do if you chose. Food options for vegans were limited. Helpful, friendly staff. Appreciated the adults only areas of the Resort. Had a great time here. Resort is very expensive for drinks and meals are a bit on the expensive side but keeping this in mind if you are willing to leave the resort and try other dining options its a perfect location. We ate at Geckos across the road from the resort and also at Tomlus which is a cheap taxi fare away. We did a tour into Port Denaru so we could do the trip to Cloud 9 and had an amazing day. The Shangri-La is set in a beautiful location and we were lucky enough to have a ground floor ocean view room. I think its more of a family location, if you are looking for nightlife you wont get much of that there. They do have a DJ who was really good and happy to play your requests. I can see why they have a lot of repeat guests !! enjoyed our time. I have visited the Shangri La on a number of occasions and always have a fantastic holiday. The staff at the Shangri La are most genuine and kind people. Their service is second to none. we stayed for 6 nights at the shangri-la fiji . excellent resort with all the facilities under one roof.even has a kids club during the day and night .only drawback were the rooms which can be maintained and cleaned better. We have stayed here before and return because we love the relaxed atmosphere and friendly service from the fijians. We had a fantastic family holiday 100% will be back. My partner and two sons stayed in January 2017. Thanks to Mun and the staff od ShangriLa, we had an amazing time. Resort a little isolated in location and we felt that we were pressured to do all of our holiday activities through the resort. Apart from that aspect, we had a fabulous stay. Lovely staff, we felt very welcomed. If you want relaxation pure in a beautiful environment for the whole family then look no further than the Shangri La Fjian. Bula vinaka to the hotel and staff! Wow what a great stay we all had a great 10 day stay. The shangri la is lovely an older resort but looking forward to see the completed renovations. I loved my massage by the adult pool and the chi spa yes I had 2 massages in 9 days. The food in all the restaurants were just delicious. My husband is a head chef and he didn't fault one thing about the food. We really did enjoy the Asian food near adult pool. All the Fijians were very friendly and hope to see you again next year. We had a very relaxing 7 night stay at he Shangri La Resort. We booked 2 rooms for a family of 5. They were adjoining which worked really well. Located on the lagoon side near the pool which was very convenient. Rooms were serviced daily and complimentary water was appreciated. Beds were so comfortable and we had the best sleeps helped by the quiet and effective aircon. Food and drinks were very expensive but the buffet choice was excellent. The kids made lots of friends and enjoyed the pool, water activities and free organised activities such as pool basketball, soccer and cricket. It was a great family holiday. This resort is very big but the Fijians still manage to remember names and provide personal service. The resort itself is clean and maintenance requests are responded to promptly and efficiently. The issue is that the resort is getting a little tired and the need to make maintenance requests came a little too often. This will probably be addressed in the current round of refurbishments being undertaken. The work on the refurbishments did not detract from our enjoyment of the property at all. Still a great place for a family holiday and within easy reach of Nadi and Sigatoka. It was a great first impression of Fiji. Great destination for families with young children as they are well catered for. The Fijian people are so welcoming and embraces you from the minute you get off the plane. Will definitely visit again and again!!! We had a very pleasant stay at the Resort. The staff were amazing, very friendly and helpful. Overall we had a great time and enjoyed our stay. Top spot for families . We will be back next year. Travel Oline sorted everything perfectly. Lots of daily activities which are free BUT look into food in restaurant and alcohol prices which are very expensive. Free Buffet breakfast is ok if you are travelling free of children go upstairs to adults only breakfast much quieter, staff are amazing and very friendly. Great location. Beautiful lagoon. Food and drink and miscellaneous expensive. We went at a slow time of year and some of the resort rooms were closed for renovations. Would be really busy with all rooms full. Staff are lovely! We just spent 10 fantastic days at the Shangri-La Fiji. It was our first overseas family 'beach' holiday with our three children (14, 12 & 9) and we LOVED IT! The staff were all so friendly and helpful and so wonderful with the children - especially their three fantastic pool entertainers - Ace, Marley & Jay! They entertained the children (and most parents) every day with Pool Basketball, Soccer, Cricket, Touch Football and Volleyball. We'd go back again just to see them! The food was nice but rather expensive, the kids did love the International Buffet as it meant they could eat whatever they wanted and as much as they wanted. The Breakfast was AMAZING - how do the ladies cook the eggs perfect every time? We did eat out of the resort a few times and that was a nice change. There were some renovations going on while we were there, but they didn't impact on our holiday at all. The whole resort was clean and tidy and the rooms were serviced daily. The main pool and beach were lovely for the kids and the free water sports were well utilised by all of us. Thank you Shangri-La for a wonderful holiday - we will be back! We were upgraded to beach rooms which were a long way from all restaurants and shops etc. However, it was a very quiet location away from the many children. The staff happily drove us to meals in their golf carts. Food and alcohol very expensive. To sum up - a lovely place for a restful and enjoyable holiday! First time back in Fiji after an absence of 35 or more years and never having stayed in a large complex like this, all I can say how fantastic the experience was. Very family orientated but with one restaurant and one pool dedicated to adults only and strictly enforced. Shangri-La is the goods. Room was great, meals had a huge selection from four restaurants, but above all of that, was the service. Room staff, bar staff, wait staff and front off house, all magnificent. My wife has Coeliacs disease and the staff couldn't be more helpful. Service alone, I rate this hotel 5/5. Had a ball Shangri-La! Location is second to none and the staff we beautiful, happy and well treated. Chi spa was out of this world..
My mum and I had a fantastic holiday at the Shangri-La. It was so relaxing and the people at the resort were so friendly and helpful - we can't wait to come back. The adults only pool and restaurants were great as we were travelling without the kids, and really enjoyed the peace and quiet. Views from the room were amazing!! You need to be able to fit to walk as it can be a long distance between the rooms and the various facilities. Couldnt have asked for a more picturesque location. Rooms were clean and provided everything required. Resort had plenty to do, in fact a great holiday except for the low quality food. Paid restaurant prices for cafe quality food. Loved everything about the resort location and feature wise. The buffet breakfasts were awesome. Our stay was great the kids had so much fun. The transfers were always on time. Would have liked to have seen a bit more local food on the menu's. A great family holiday, with everything for the kids! We loved our stay at the Shangri-la. The location is a kids' paradise, with the fantastic child-friendly pool, and beautiful shaded beach just on the doorstep. Everything was close - eateries, shops, playground. The staff were endlessly helpful and polite - they went out of their way to guide us to wherever we needed to go, or to answer our questions. My daughter Cleo had her 5th birthday party in the Cabana by the sea, and it was even better than I anticipated. Luce and the team really pulled out the stops to make the party a memorable occasion for the kids - down to the last detail (and there were a few special requirements which took extra effort!). Only a couple of suggestions for improvement - getting into the Lagoon Restaurant for dinner seemed disorganised and difficult - with four tired children, that was a little frustrating. Checkout also took 35 minutes, which delayed us leaving for the airport - there were a few errors in the final bill to work through (discounts hadn't been applied, something was overcharged etc). I'd suggest that process needs fine-tuning - even if guests are contacted the night before to check through the bill as a matter of course, this would save time. Overall however, this was a fantastic holiday that we'll never forget. All our memories will be positive, and we'd certainly recommend the Shangri-La to our family and friends. What a fabulous location with wonderfully friendly Fijians, however décor could really do with an update, especially in the restaurants. worth staying at the lagoon end if you have children as close to beach and pool . Great spot for family break . I have been twice and would go back again ! We had a good time an the service was very polite and quick for the Fiji I remembered from many years ago. The food was good at most restaurants. Except the Adults only dinner was a bit expensive for the quality of the food. A the wine prices were over the top. Golf course is interesting, and the best on site course in Fiji with some very beautiful holes. All considered we will be back!!. Highly recommend the Shangi La for anyone we went over as a group of 10 ages from 10 years old to a 60 year old to celebrate my 40th birthday the Shangri La celebrated with us providing cakes flowers & celebration dances! staff are just beautiful the resort itself is amazing not one minute was anyone bored! Food variety & activities were in abundance no need to leave the resort as its all there for you our rooms were perfect! We can not wait to go back. Awesome Holiday to Relax and Chill. Our first time to Fiji and Shangri-La with a young family and we were extremely happy with our selection. The resort is situated about 1hr from the Nadi Airport and the complex is huge covering all services along with a fantastic sandy beach for swimming. We were satisfied with the Ocean view family room, the rooms were cleaned and serviced daily with only the TV picture a bit fuzzy in our room as a negative. The staff were wonderful with the kids and the kids club and activities offered for the young ones was awesome giving us time to spend for adult dinners. The buffet breakfasts included in the price were fantastic, and the various restaurants on the island gave us enough dining options. Overall the food was reasonably priced and the quality was descent, the higher cost buffet options with shows gave us also some variety. Overall we had a great holiday and would not hesitate to go back. A great place for all to enjoy young and old.A beautiful spacious and spectacular location with breathtaking views .Awesome staff to make sure you have a great holiday .Very friendly environment. Only thing that you guys need is better stand ups and paddles get good size stand ups easy to use . This is a great resort for young children and as the main purpose was to spend some time with our 4 year old granddaughter it was perfect . The staff are absolutely wonderful . Having read the reviews we were a little worried but found that the resort and service were fantastic. The only complaint we would have is that the 'free equipment' was often not available as there wasn't sufficient available for the numbers of guests. If you have young children you will find this a fantastic destination. We have a teenager and it was less captivating for this age group but still relaxing. The Shangri la was amazing for our family, after reading some reviews prior to going I was a little concerned however our room was great (didn't spend much time there) the staff were amazing and super helpful, definitely going back sooner rather than later. My family and I had a great time. Pool, beach, kids/adult programmes, activities - there was constantly something to do. Locals were nice and helpful. Highly recommend it to families. Love Fiji Time. Totally relaxed. Played golf every day. Looking forward to returning. Was amazed at how the staff treated not just me but everyone soo friendly especially with kids. Plenty of activities to do. Great resort the staff made our stay perfect with smiles coming freely. Also we were given a free upgrade. The adult only breakfast area was great. My husband and 2 children (5 and 6 yrs) and I stayed at the Shangri-la Fiji for a week at the start of June. The staff were friendly and accommodating. Despite renovations occuring at the main lobby checking in and out at the alternate lobby was no drama. We stayed in a superior lagoon view family room which was perfect for us and allowed easy and close access to the lagoon pool and beach. If travelling without children or if you want a quieter aspect then an ocean view room would likely be less busy. Alfred in the little chief's club took the kids on many adventures and our girls visited there for some activities on a few occasions. They have activities for the kids right up until 9:30pm if they wish. We stayed mostly within the resort complex but the school and village tour we did with Ace was great definitely recommend it, its only 3 hrs so not too long for the kids and you don't actually travel that far from the resort. I would definitely recommend getting your transport from the airport to stop at a local store prior to getting to the resort to pick up some bottled water and snacks ect also bring some duty free alcohol with you if you plan on drinking as the prices of bevvies and snacjs at the resort are typical inflated resort prices. The food was probably the biggest let down of the holiday, it was pretty ordinary and fairly hit and miss. The tekali restaurant with it's asian inspired menu was nice and the italian buffet night at the bilo bar was yum. We went to a polynesian themed night and whilst the fire dancers and knife dancers were great to watch the food was again a bit of a miss with us. We missed the fire walkers, which were only on a saturday night. Overall it was a great holiday and a fantastic resort for the family we had a great time. My partner and I stayed at the Shangri-La Fijian Resort & Spa for 8 nights and had a great time. Being my first time in Fiji, I was blown away by the warmth and hospitality that was provided. Our room was on the third floor and over-looked the green lawns and just beyond that was the lagoon, which was a beautiful view. The staff were always happy, polite and incredibly helpful. We met a lovely woman named Kereni in the Terrace Lagoon who was always happy to serve us with a smile and a chat, and made dining at the restaurant always a pleasure. The resort offered a lot of great activities for adults and children alike that ranged from water sports to shows to outside tours, and we were completely enchanted when we went parasailing on our third day, the view was spectacular! I would definitely recommend this resort to future travelers, especially if you have a young family! I can most certainly see myself and my partner coming back here again! An absolutely stunning location, people very friendly and the kids had an absolute ball. We are so glad that Travel Online recommended the Shangri-la. It was perfect for us. Beautifully positioned resort with warm, friendly staff. Breakfasts were amazing. Other food was relatively expensive as can be expected at a resort. Indianas restaurant in town was delicious. Staff were wonderful with our children. Overall a wonderful family holiday! Greta place for families or couples who just want to relax and chill out! We absolutely loved the Shangri La. The location, facilities and staff are fabulous. We will definitely be going back! Enjoyable break away. The Fijian people are so very welcoming and friendly it was a pleasure to meet and speak with them. Arrived just 3 days after cyclone Winston. As you would expect occupancy was low. Resort was in really good order. Staff as usual always friendly and courteous. So anyone wanting to help FIJI, go their for a holiday and boost the economy. Will be returning next year for Bilo Bar reunion. food average, excellent location & very clean well maintained grounds. There was so much to do at the resort we didn't need to rush anywhere and were able to truly relax while on holidays. While our teenage children took advantage of the pools, lagoons, snorkelling and fun friendly organised activities with the other guests we were able to swim in the adult pool and enjoy many of the delicious cocktails and food available. The Natadola Magical Tour was a definite highlight of the holiday and we would recommend people do this tour organised through the staff at the resort. Food was delicious, the staff were friendly and we will definitely be returning in the future. Certainly a family holiday to remember forever!!! Sangri-La Fiji was a wonderful resort, especially for families. Kids club (right up to 9pm) was a real treat for us parents allowing us to have a quiet dinner alone. All pools were fabulous (kids and adults only) and food at all restaurants was great (buffet options were slightly average however). I would definitely go back to this resort. We traveled with a 3 year old and was so impressed with the location and facilities! Pools were amazing, the beach was fantastic and so safe. Staff were always lovely and doted on our son. We did desire more free night entertainment as other resorts offer this but that was the only downer. Otherwise a lovely relaxing stay! For the cost of this resort, the rooms definitely need an upgrade. The pull out lounge was not a good bed for my 11 year old daughter to sleep on. The main bed had big divits in both sides. Analog TV bit behind the times. Imery, Josie and Soulios fabulous job doing my girls hair, it was their favorite part of the trip. All staff were welcoming and friendly. Special thank you to Imery who offered to help me take my braids out when she could see i was struggling. Big thank you to Alfred at kids club who went out of his way to ensure my girls had a great time. Alfred always greeted my girls with open arms saying " my children" followed by going jokes. My girls haven't stop talking about him since they got home. Lala- my children said she was very kind at kids club. Solo, who waited on our table most days for lunch was very welcoming and provided a great services throughout the duration of our stay. Solo was the reason we continued to dine in the restaurant for lunch. We found Keni to be very informative about activities and tours which helped us a lot as this trip was the first time my family has been overseas. Keni was always helpful and didn't hesitate to assist us when we had enquirers/questions each day. Ace- Very funny and entertaining we all loves it when he was around. Relaxing and no need to leave the resort. There is little choice in dining options outside the resort and everything in the resort is expensive. Excellent choice for lovers just wanting to spend time together. We paid extra Money to stay in a ground floor room with a door leading to the outdoor space and the beach and pool area however to lock the door and then gain access we had to constantly walk around the back of the building. I would like to suggest that card access be put onto both doors in the ground floor rooms. WE THOROUGHLY ENJOYED OUR STAY, NO PROBLEMS WHAT SO EVER. We had fantastic time. Staff at the resort was very helpful and accommodating. Kids club has many good activities. Lagoon pool has great views. Food options are limited for vegetarians. Lunch/Dinner buffet can be a bit pricey. Our Fiji to trip was ABSOLUTELY AMAZING, I wouldnt have changed a thing. From the pick up from the airport to the time we flew home was incredible. The Shangri-la was more than I could have ever expected. I was SOOOO happy with the treatment we had, the boys at the gate, were awesome VERY SINGLE time we came through the gate with their welcoming "BULA" (even if it was at 2-4am in the morning). The front desk crew, who were always standing there with the biggest smiles and willing to assist with whatever it is we needed. The housekeeping service was awesome as they would keep our room looking sharp everyday and leave cute messages each night using leaves. The nanny service and the guys who would entertain the children down by the pool were exceptional, they were SO good with kids. All the crew who were serving at the bars/restaurants were always serving with a smile. And so with all of this service and smiles and "Bula's" we had such an amazing time, would definitely recommend this place. lovely place a little dated but still very nice and lovely beds, bar and check in staff were a little to casual but hey, its Fiji time. thanks for a great stay. Nice resort for all a little out of the main towns but really you don't need to go any where as everything is provided. The Figian people are the friendliest people we have ever met. Just returned from 10 nights at the Shangri-La and I'm missing all our Fiji friends already. Staff were fantastic with our children (ages 8 & 9) and kept them (and us) entertained with activities all day & night. Beautiful lagoon for swimming, kayaking & snorkelling. Great local restaurants. Eating and drinking in the resort is fairly expensive but once you're there and having fun you seem to forget about it. Try to stay near lagoon lawn if you have small kids. Other rooms are too far away. We have just returned from a 10 night stay at the Shangri-La, with 3 children, 13, 11 and 5. It was brilliant, beautiful weather, beautiful people. The staff cannot do enough for you, they adored the kids and went out of their way to make sure they were always having fun. We were warned about the price of food, so we were prepared but we still found some things a little excessive. The resort would really benefit from a nice fresh sandwich bar or some more options for lighter meals. Thanks for your valuable feedback. Unfortunately due to sourcing fresh produce the meals can be a little higher in Fiji. We are pleased to hear you loved the resort. Went along with my three teenagers, will definately return. We just arrived home from eight nights at the Shangri La Fijian and can't wait to return. Our family our four comfortably stayed in a Delux Ocean View room which has incredible views over the reef, and the breaking waves of the Pacific Ocean in the distance. Although there was a walk of about 5 - 7 mins to get to the Lagoon Pool and restaurants, we appreciated the manditory excercise given the amount of delicious food we were eating all day and night. The Little Chiefs Kids Club was really enjoyed my our boys (6 & 8), who loved the variety of activities on offer. The Chi Spa is a must for mums and dads! I would highly recommend this resort as the perfect place for a well earned family vacation! Loved the resort, loved the staff. The rooms and the resort in general were kept in immaculate condition. Would highly recommend and would definitely go back. We had a lovely stay at The Shangri La , the resort is huge and lots of options for dining although they could do with some improvement , the prices are very overpriced and the quality of the food was not that great. the resort is lovely , The Chi Spa is just amazing and its just like another world when you go in for your massage! staff and grounds are lovely. We are used to smaller resorts that everyone knows each other and by your first name but this lacked that here I suppose because its so big but overall I would recommend the resort. Great for teenage families. Plenty to keep them occupied. Would definitely stay here again. Can recommend the village tour and lunch to Sigatoka. We returned for our 10 year wedding anniversary after being married here 10 years ago! It was made very special by having flowers and wine delivered and the service received for our special dinner. Location of resort was stunning and lots of amenities and facilities for families including two superb family friendly pools, a wonderfully calm beach for swimming and playing in the sand and a fabulous kids club and playground. Day Spa was a lovely indulgence at the end of the stay and the treatment and treatment room was really special. Beach side massages also a lovely treat. Enjoyed the free water sports as well. Food was probably the major let down of the stay. Not enough choice around the pool. Did enjoy the theme dining including Polynesian dance show and BBQ nights. Food costs mid-Australian prices so budget accordingly for lunch, dinner, drinks and snacks. Not much outside resort but a few areas worth exploring like Sigatoka via the Coral Coast Railway, Kula Eco Park etc. All in all an enjoyable, relaxing and warm break after a long cold winter in Melbourne! Our stay at Shangri La was as we expected, as a family - 8 of us. Nice quiet superior ocean view rooms, was a big plus and we enjoyed the long walks to the central areas. Apart from windy weather every day, we had lovely fine sunny days, which enabled us to enjoy the pools and beach areas. Tennis and put put golf were enjoyed too. We tried all the restaurants for dinner at night. Except for the Lagoon Restaurant buffet, the table service was dreadful. We would be seated at dinner opening hour of 6pm, and would wait up to 1 and a half hours after ordering, for our meals to arrive. We ate at the Beach Bar & Grill one night only, and decided we would not go there again. We waited 1 hour and a half hours for delivery of meals. 7 out of the 8 in our group, did not receive the correct meals and steaks were either under cooked or over cooked. I would not recommend anyone to eat at this restaurant. It needs a shake-up. The Fijian people were very friendly and helpful in all other areas of the resort. We would recommend the Shangri La resort to others. We had the best time at Shangri-La they are all so friendly. My daughter is coeliac and the chefs were absolutely amazing. We will be returning. Great fun and relaxing but expensive! We have just returned from our honeymoon. Its a very family orientated resort. Great facilities, amazing views of the ocean and lagoon. People were lovely, but the food and beverage service was very slow, the resort buildings are looking tired and will soon need some repairs. Room was lovely. Resort is a no cash resort, so everything is booked to your room, which is really handy. But be careful there is a 3% surcharge on your final bill for using any card to pay. The hotel is a bit tired and needs a lift, but the pools and beach are great - especially for children. We had a ground floor room, near the coral pool which was great. It was a bit of a walk to the main kids pool and little chiefs club - so it was quieter, more relaxing but still had a pool close by and grass area for kids to play outside. The staff are fabulous! Service is a bit slow but once I relaxed into holiday mode it was fine. The staff are lovely, very welcoming and the nannies are wonderful and warm to the children. The little chiefs club is perfect. The food at the hotel is average and basically Sydney prices. The Pizzas were good and a wide selection on the buffet. Takali (the Asian restarunt) was definitely the best (kids don't eat free though - good for an adults dinner). Cocktails - especially at happy hour! - were good. Overall, a really good family holiday. It's not five star Shangrila - but perfect for a reasonably priced family holiday with good facilities. We had a ball, the kids really loved the people. culture and everything about the resort. The resort staff were amazing, they were great with the kids and nothing was a problem for them. The food was wonderful but it was hard to find something really simple and inexpensive for the kids, especially with a fussy eater. The organised activities were brilliant, Mun did a great job, his tours and events were so much fun, he thought of everything, and made us all feel special. We got to experience so many things that our kids will remember for a lifetime, and gave them some real perspective on how others live. Our rooms were good, perfect location, ground floor, overlooking the pool and the lagoon, everything we needed was there. As a family we would go back and definitely recommend to any one with kids. Very nice resort with plenty of things to do for everyone. Kids had a great time! Everything was perfect from the Staff servicing the room (Maree) and around the resort to the postcard views everyday. Only reason I marked room down was a bit small for a family, we had one child but would be very crammed with two children and two adults. The room was in the perfect location overlooking the lagoon, so I was very impressed with that. Dining I marked down only because my daughter is gluten and dairy free which I found a little difficult. The resort and nearby restaurants did cater for gluten free but the lack of ingredients listed or Staff familiar with ingredients in the products was difficult to be 100% sure I was giving her food that was free from dairy as well as gluten. Staff at the restaurants were wonderful and the food that we had was really good quality. Buffet breakfast was really great with so many choices. Kids club staff were fantastic with my daughter and we really enjoyed the mini golf as a family. So many things to do the resort was excellent for a family. A really beautiful place and lots for kids to do! Could not have asked for a more beautiful place to go on holidays. Resort staff are very friendly people and are great with Kids. Our 5 kids had a great holiday. The only down side food very over priced! Beautiful spot on the Ocean, fantastic facilities. Great spot for families or singles.